So do bloggers and journalists. That’s why adding a link to a quiz can super-charge your press release and tip the scales in your favor that a website, newspaper or magazine, or your favorite blogger will announce your news, or use the quiz by itself. Each year, The American Kennel Club announces its results for The Most Popular Dogs in the U.S., based on registration statistics. Read the press release for the 2011 rankings. Here’s a screenshot of what appears at the end of the release. Notice all the links and the invitation to use the trivia questions. 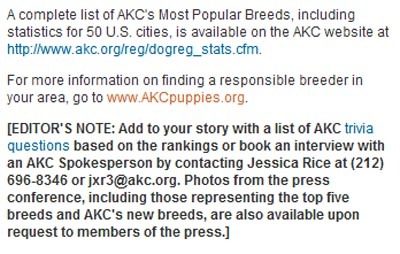 I also love the list of statistics for 50 U.S. cities, the invitation to interview the AKC spokesperson, and the note about photos. 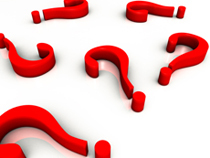 What kinds of quizzes have you offered with press releases?